Crocus by Teddy Hermann Original, hand made of the finest cream mohair. 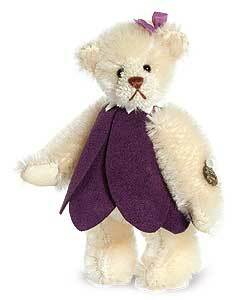 A wonderful miniature teddy bear from this famous German teddy bear company. She is wearing a purple dress with a purple bow in her hair. Comes boxed with numbered certificate This product is not a toy and is intended for adult collectors only.